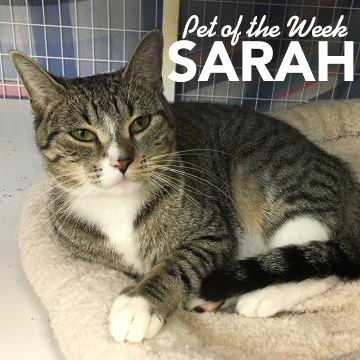 Out of all the cats, they picked me, Sarah to be the PET OF THE WEEK! First thing the volunteers say to me is that I'm a lover! I love hanging with the peeps here. And it has nothing to do with the belly, chin and back scratches or all the treats they give me. Well, maybe a little. What I would love is my very own view of the outside, perhaps sun bathing on your couch in front of the window or my very own little cat tree! If you're thinking I would make a good addition please stop in and visit me! 184 Verona St. Adoption fee for Pet of the Week is FREE! All of our pets come with lots of extras. This includes up to 50.00 instant merchandise vouchers, free vet exam certificate, microchip and are fully vetted with all their shots and deworming. Please come see us at RochesterAnimal Services 184 Verona St. or browse for more pets online. If a video has been removed from this page, the featured dog or cat has been adopted or transferred to another animal welfare organization and a new video will be loaded soon. Each week, Rochester Animal Services selects one adoptable animal to showcase.